In a move with potential major political implications just days before the midterm elections, President Donald Trump said Wednesday that the deployment of active duty forces to the southern U.S. border would increase dramatically -- to 10,000 or 15,000 troops. "We have about 5,000. We'll do up anywhere between 10 and 15,000 military personnel on top of border patrol, ICE [U.S. Immigration and Customs Enforcement], and everybody else at the border," Trump told reporters on the White House South Lawn on Wednesday. The numbers cited by Trump would be a significant increase over the 5,200 active duty forces originally slated by U.S. Northern Command (Northcom) to stop a migrant caravan, still some 800 miles from the U.S.-Mexico border. Fifteen thousand is roughly the number of U.S. forces in Afghanistan and three times the number in Iraq. Later on Wednesday, U.S. Northern Command announced that it now estimated that 7,000 active duty forces would be used for the mission to support Customs and Border Protection personnel. “The number of troops deployed will change each day as military forces flow into the operating area, but the initial estimate is that the DOD will have more than 7,000 troops supporting DHS across California, Arizona and Texas,” said a statement from U.S. Northern Command. Trump repeated on Wednesday that the caravan, which he says contains Middle Easterners and terrorists and will be a central issue for the 2018 midterms, was "very dangerous." "I'm not fear-mongering at all. Immigration is very important," Trump said. An original caravan of Honduran migrants set off for the U.S. border two weeks ago and is currently in southern Mexico. In his remarks, Trump highlighted the violent interactions this week of a second caravan as it crossed the border from Guatemala into Mexico, as well as the possibility of a third caravan originating in El Salvador. Wednesday morning, Trump tweeted that "The Caravans are made up of some very tough fighters" who had "fought back hard and viciously against Mexico at Northern Border before breaking through." Earlier Wednesday, asked if the deployment of active duty troops was a political stunt ahead of the midterms, Defense Secretary James Mattis said those forces are in support of the Department of Homeland Security "who needs additional military assistance." "We don't do stunts in this department," Mattis said on Wednesday. Pentagon officials did not immediately have a comment on the president's statement that the number of troops could dramatically increase. Army Lt. Gen. Jeffrey Buchanan, U.S. Army North Commander, briefs newly arrived Soldiers from 4th Infantry Division, Fort Carson, Colo., and Fort Knox at Lackland Air Force Base, Texas, Oct. 31, 2018. Northcom's increase of the size of the mission to 7,000 appears to have been part of initial planning. ABC News had learned that in addition to the 5,200 active duty troops originally deploying that 2,500 additional forces had been placed on "prepared to deploy" orders in anticipation of future requests from Customs and Border Patrol (CBP). The top U.S. general in charge of the deployment -- dubbed Operation Faithful Patriot -- told reporters earlier this week that he expects additional active duty troops will supplement the 5,239 already slated to deploy, depending on future CBP requests. "There will be additional force over and above 5,239," Gen. Terrence O'Shaughnessy, the head of U.S. Northern Command, said on Tuesday. "The magnitude of that difference I don't have an answer for now because we don't know what that answer is." There are already 2,100 National Guard members who have been stationed in Arizona, New Mexico, and Texas since last April. However, that number is below the cap of 4,000 Guardsmen that Mattis previously authorized for the border security mission. Personnel and equipment prepare for departure from Fort Campbell, Ky., Oct. 30, 2018, as part of "Operation Faithful Patriot." A CBP spokesperson told ABC News on Wednesday that Guard's presence "has led to more than 28,200 arrests and the seizure of more than 35,700 pounds of illicit drugs across the Southwest Border sectors." 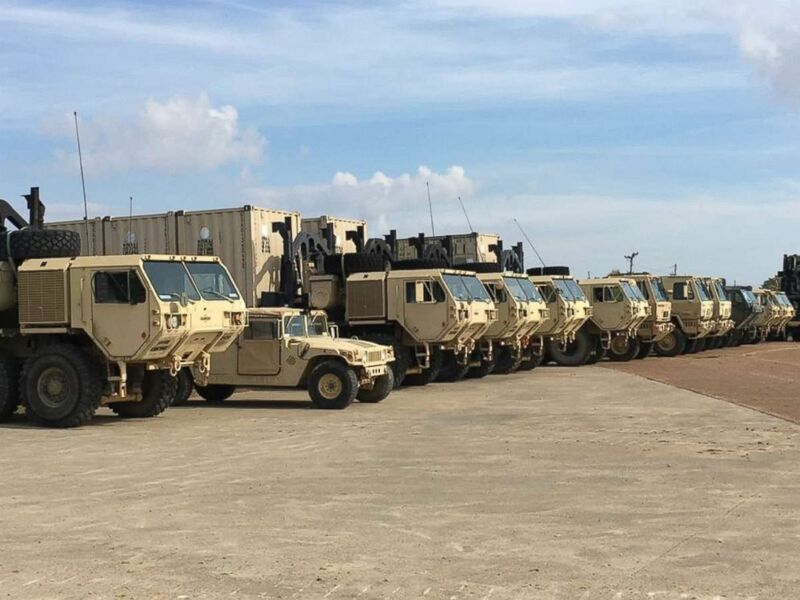 "While National Guard troops are not physically arresting aliens or seizing contraband, these outcomes are attributed to the support they provide CBP, including monitoring sensors, operating detection systems and repairing existing infrastructure," a CBP spokesperson said. "Ultimately, the mission gives us more eyes on cameras, more aircraft in the air surveilling and more boots on the ground patrolling." Like the National Guard troops, active duty forces will also act in support CBP and cannot act in a law enforcement capacity.